The Spaceman 6250H – Mid Capacity, Twin Twist Floor Standing Soft Serve Machine is Ideal for Ice Cream, Custard, Frozen Yogurt, Gelato, and Sorbet! 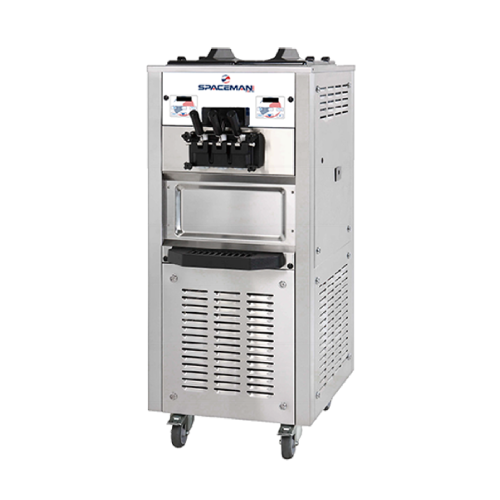 The Spaceman 6250H is the premium soft serve option for mid to high capacity businesses that want to offer more variety on their dessert menu. Dual controls allow the operator to independently manage settings for two different flavors, plus swirl in the middle. Good for ice cream, frozen yogurt, gelato or sorbet, this model has convenient locking castor wheels and user-friendly digital control boards to adjust settings as needed. The hopper agitator will stir product throughout the day, saving operator time and ensuring an even cool in the hopper. Patented freezing technology on the 1.8qt cylinders means a super fast recovery time, producing up to 50 qts/hr, or more than 400 small servings every hour. Our most popular model! The Spaceman 6250H is the winner of The Frozen Yogurt Reviews best of soft serve machine for frozen yogurt stores. Our most popular twin twist, two flavor soft serve machine is ideal for a variety of applications! Independent control system per cylinder.